We hear you. We're going to shift, transform, overhaul, vitalize, and enhance each common space until every space is more appealing and functional. We're working hard to identify old, worn-down rooms, design fresh spaces that inspire and calm, and maintain it for long-term use. It takes each and every one of us to help in the upkeep of our new common rooms. Every person has a role to play. SGA is working closely with Residence Life, Physical Plant, and cleaning personnel to develop a plan to not only have great spaces this year, but for years to come. Help us by being respectful of our redesigned rooms. Encourage friends to take care of the furniture, throw away trash, and return the room to it's intended layout. Notice a problem with a space? Don't let it go unnoticed. Let us know and we'll work to address the issue right away. Why we're investing in the dorms. Common space is the #1 concern among students. It affects nearly every student, and has been consistently in the top concerns of the annual student survey. Student Government is your voice, and we're taking action to address these concerns and constantly work toward an even better campus. 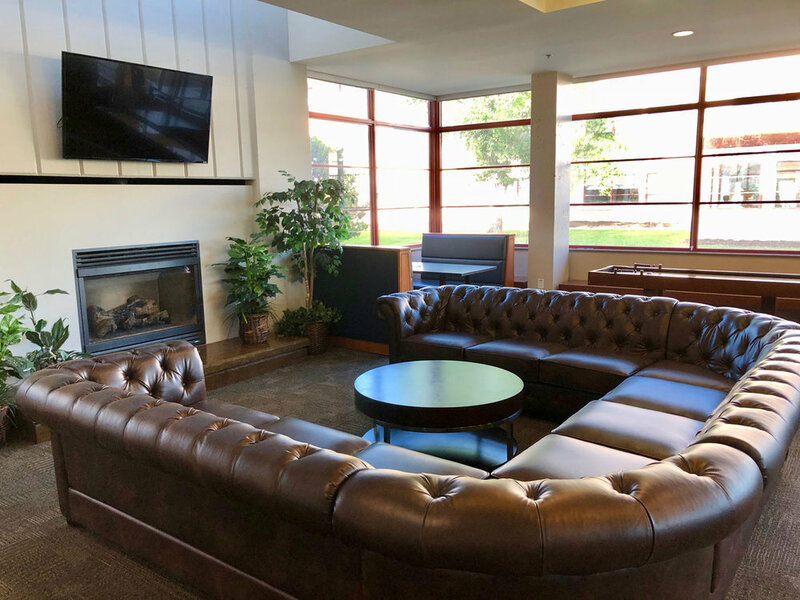 Alexis Stypa ('16) had a dream to completely revamp the JPII Lounge: to make it an inviting space for both studying and hanging out with friends. With the help of Student Government, Alexis made her dream a reality. Durable wood flooring, a fresh coat of paint, modern tin ceiling tiles, three new countertops, nine pendant lights, and new furniture make up the lounge. It took a little while, but with intensive brainstorming, planning, early-morning meetings (and a little bit of coffee), and strategic partnerships, the JPII Lounge is better than ever before. We got rid of the broken table and folding chairs in favor of a new conference table, black executive chars, a whiteboard, and accent decor. Not too shabby, eh?